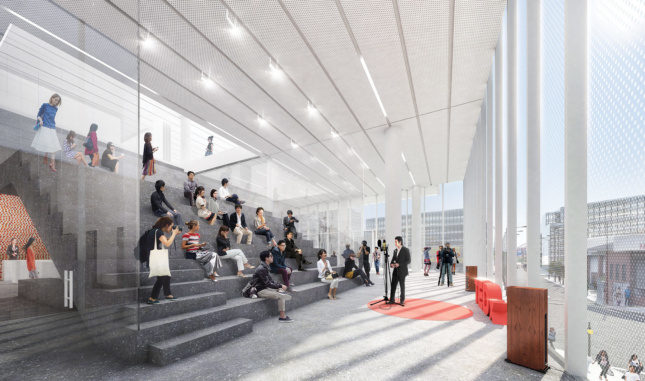 Asian Americans for Equality (AAFE), an advocacy and community development agency based in Flushing, selected JCJ Architecture and Leong Leong to design the Center for Community and Entrepreneurship, a 90,000-square-foot business incubator and event space that will serve as a fulcrum for the neighborhood. A New York nonprofit powerhouse has commissioned two local firms to build out its mission in Flushing, Queens. The announcement comes at a time of great growth for the neighborhood, a major commercial center for New York’s Asian-Americans. 70 percent of Flushing’s 72,000 residents are Asian, and the area is home to one of the world’s largest ethnic Chinese enclaves. “Vibrant,” that go-to good streets descriptor, doesn’t adequately capture the level of activity along Flushing’s main thoroughfares—Roosevelt Avenue, Main Street, and College Point Boulevard. Main Street is second only to Times Square in New York City foot traffic. Here, shoppers from all over the region access multi-story mini-malls through ground-level stores whose wares spill onto packed sidewalks that the city is spending nearly $8 million to widen. The Center for Community and Entrepreneurship addresses a dark side of this prosperity: International real estate investment and a growing population have raised property values and commercial rents, making it tough for new enterprises to get off the ground. The center will sustain AAFE’s holistic development approach and build on its legacy of community investment. Since its founding 42 years ago, the organization has created more than 800 units of affordable housing and given $44 million in loans to 1,000-plus small businesses. The building’s seven-story gradient of public-to-private use beckons residents inside, while the program—a twist on the Flushing commercial typology of stacked retail—tackles challenges posed by the neighborhood’s rapid growth. 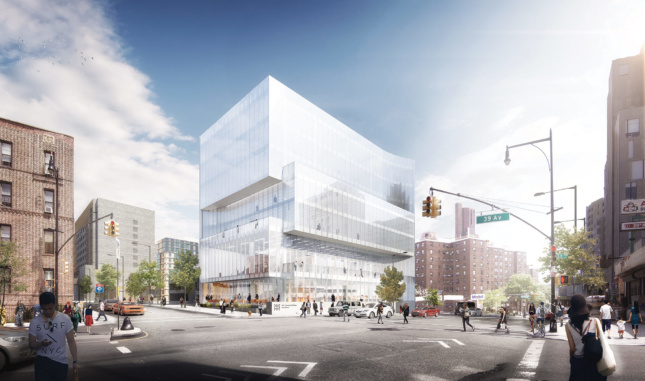 A public plaza at 39th Avenue and College Point Boulevard, the architects explained, anchors the building to the neighborhood by drawing people in from the street, while private offices occupy the upper levels. life, while upstairs, a flexible event space opens onto an adjacent terrace. A three-story open staircase, wide enough at its base for seating, connects the space through the third level. “From the plaza up to the stairs, you are metaphorically tracking the mission of AAFE,” said JCJ principal Peter Bachmann. A third-floor incubator will provide co-working space, where emerging businesses will get assistance from the AAFE-affiliated Renaissance Economic Development Corporation. “The center is not only about providing affordable space,” said Christopher Kui, AAFE’s executive director. “It’s about networking opportunities and resources.” The nonprofit, whose offices will occupy the fourth floor, will lead entrepreneurship classes geared specifically to small businesses. As they grow, firms can rent space on floors five through seven. 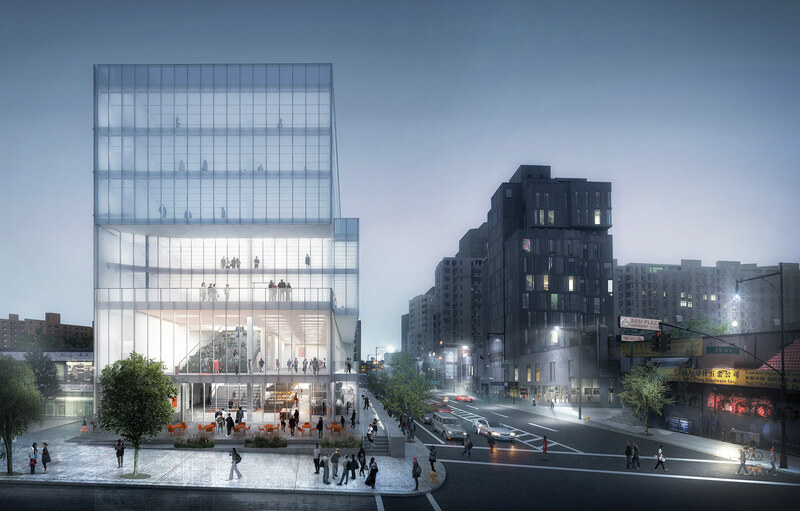 A reflection of the hybrid program, the facade is most transparent at the two lowest and most public floors. The glass increases in opacity as the eye ascends to the upper, non-public floors, explained Chris Leong, Dominic’s brother and cofounder of the firm. The lot line wall is clad in metal panels and roughly mirrors the glass walls’ spacing. Overall, the building respects its lot line, but, unlike a “jewel on the block,” it’s not trying to define itself against its context, Dominic said. 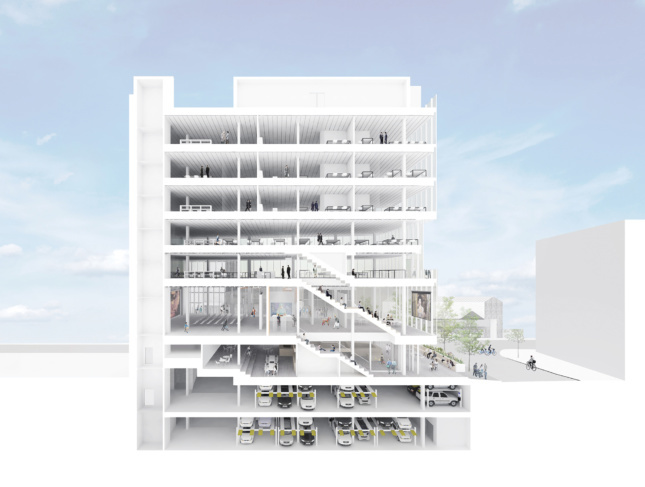 It has a slight curvature in plan that brings it up the lot line, while the corner lot ensures that adjacent developments will respect the building’s profile. AAFE awarded the project to the firms last fall, and the center is expected to be complete in 2018. Leong Leong and JCJ have mutual respect for each other’s desire to work with mission-driven organizations, and the architects stressed the strengths they bring to the project. JCJ has seven offices and a deep portfolio of community-minded projects, while Leong Leong is known for bringing its impossibly cool aesthetic to projects like the U.S. Pavilion at the 2014 Venice Biennale and the Anita May Rosenstein Center, a new campus for the Los Angeles LGBT Center.